Richard Morden joined QuadReal as Senior Vice President, Office, Prairies in February 2017. His focus is leading the Prairies’ office team, which manages over 8 million square feet of office real estate in Calgary and Edmonton. Richard has been active in commercial real estate for over 30 years in Toronto, Vancouver, for the last 14 years, Calgary. 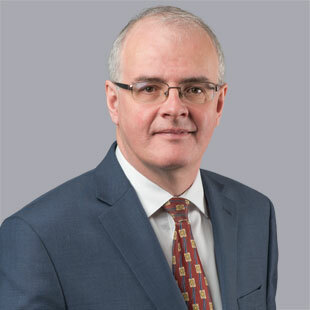 Previously, Richard worked with Bentall Kennedy and Beutel Goodman Real Estate Group, where he held positions focusing on investment and portfolio management, and supplemented by transactional experience including acquisitions, dispositions, development and financing of commercial real estate totalling over $2.6 billion in value. Richard holds a B.A. in Urban Geography from UBC, an MBA from The Richard Ivey School of Business, and has completed the Business Leadership Program at Queen’s University. Richard is currently Secretary/Treasurer of BOMA Calgary, a member of the Board of Directors and Government Affairs of NAIOP and a member of Calgary Economic Development’s Real Estate Sector Advisory Committee. These industry positions provide Richard with the opportunity to contribute to policy that directly supports the interests of those living and working within the QuadReal portfolio, as well as communities as a whole.